Elizabeth Warren, the chief watchdog of Wall Street, has warned us that the biggest banks are now even bigger than when they caused the financial collapse of 2008. The four largest have grown 30% larger and the five largest banks represent over half the market. That brings the word antitrust to my mind, but that is about as likely as world peace at this point. No, the current crop of US politicians in both major parties are far too business friendly to go for the ‘nuclear option’ of pursuing an antitrust suit against a major corporate bank. It will take some new blood to pursue new options, Elizabeth Warren being but one example. If this November’s elections can be read as a sign of anything it is that people are fed up with austerity and they want politicians who will work for the working class. One tangible example being the election of the socialist Kshama Sawant to the Seattle city council, in a state who just legalized recreational cannabis. Washington is definitely moving in the right direction, but we will have to see how things go in a few months to really know how well the cannabis legalization is going. Another major progressive win was the 73% landslide that road Bill de Blasio to victory as the new mayor of New York, dethroning the former king mayor Bloomberg. While we have more progressives winning in local elections we lack true progressives in the federal government. There is Elizabeth Warren and Bernie Sanders, that’s about it. There are also rumors about Elizabeth Warren running for President in 2016, which would probably the only ticket the Democrats can put forward that I’d vote for. Which is still better than the no chance the Republicans have for my vote. This may be the first Presidential race I sit out on due to a lack of interest in all candidates…it is still two years from the election though and two years is a long time. President Obama may have been progressive in 2004 when he advocated for cannabis decriminalization and a single payer option for health care, but a decade changes a man and he is as much an establishment Democrat as Nancy Pelosi now. This can be seen best in his devolution on the issue of cannabis. Where he was once firmly in support of legalization, even being the leader of a drug gang, his support is now so weak he is willing to call commuting the sentences of drug war 8 prisoners a win for human rights. We’re talking about a man with a secret ‘kill list’, that is not the kind of progress I want our progressive movement to embrace, that is Orwellian at best and Stalinist at worst. I support much of what President Obama has done, but I oppose at least that many of his actions too. Like President George W. Bush before him Obama is a mixed bag; he wins a Nobel peace prize yet keeps a secret kill list, oversees more paramilitary raids of cannabis dispensaries than Bush and gave the go-ahead to a spy game so massive it makes Watergate look like child’s play. You might now be asking yourself, “what should a progressive movement look like in America?” Here is what I envision it to look like and what I hope its priorities will be. I imagine it will look much like the 73% majority that rode Bill de Blasio to victory in New York, inclusive of nearly all races, religions, and demographics conceivable. This new progressive movement will not be bound by race or religion like past political movements; it will progress beyond race to be a movement focused on results, such as raising the minimum wage federally improving the lives of millions of all races. That isn’t to say this new progressive movement will be colorblind, if anything it will be more sensitive to the factors that make us up than any former movement and it will fight for our right to be ourselves, whatever that self may be. This new progressive movement will work to progress gender equality and end de jure and de facto discrimination against gender non-conforming people. Tied in with gender equality is equality for all sexual expressions and sexes. Simply put, this new progressive movement should fight to advance the progress of as many people as possible, especially those who are presently disadvantaged. This movement is likely to include some uncommon alliances, like one we may now be seeing between the drug policy reform/drug legalization movements and gun rights advocates. 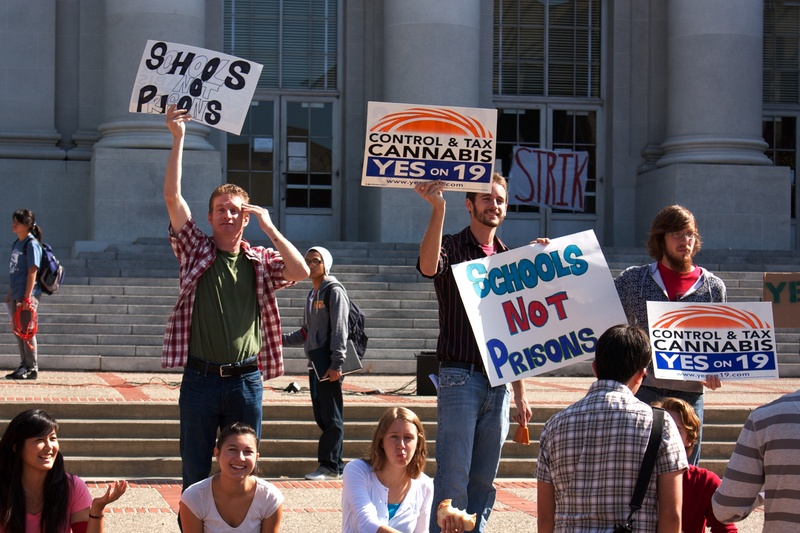 There also is a clear synergy between the drug legalization/prison reform movement and the effort to provide more funding to our schools (here is a protest to save public education, here is one for drug policy reform, notice the similarities?). 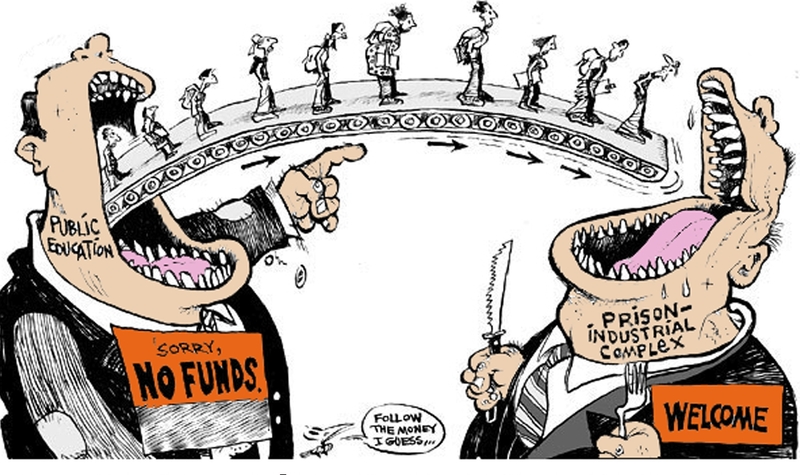 The reason for the natural alliance between education and prison reform is illustrated beautifully by this drawing. As schools are robbed of funding the quality of educational environment plummets, leading to more crime down the road when people resort to crime to pay the bills their abysmal education cannot. This is a self-perpetuating downward spiral that can very easily be reversed with more people flooding into schools instead of prisons. This would also free up billions of dollars a year in federal and state budgets due to less policing of non-crimes like possession of cannabis. * Is it a progressive movement or an honest-populist movement that is most needed? The Tea Party grassroots and Occupy are both against the Wall Street purchasing of our Congress, and yet fight each other on social issues. Can we have a party with deep progressive values that can work with — or actually include — hard-working, charity-giving, screwed-over working class social-conservatives? The alliances you list are really important. I guess I am enamored with the term progressive because it implies progress not tied to economics or partisanship. Populist certainly is a term I can get behind as well. Occupy and the Tea Party movement that preceded them were both stirrings of the movement I am hoping will manifest, but not fully there. There is one part of your first point I disagree on, that of a party. I am not calling for the creation of a progressive political party, I am calling for the propagation of progressive/populist values. I feel that political parties are a major evil that led us to where we are today. To your second point, what does movement mean, a movement is a collective of people working together towards a political goal/set of goals. It can be pretty open ended and for my part I hope it does not include the formation of new political parties, but I am very anti-party. I view political parties as some of the biggest, best networked, and most insidious special interest groups out there. I too am very impressed that progressives managed to get Elizabeth Warren in, that was a huge success.